This 4DaFunk release is sourced from the same recording as the previous ‘Coachella…The Coolest Place On Earth’ release. Performance aside, my main gripe was that the recording was rather dull and lifeless and lacking any depth or punch. While 4DaFunk clearly aren’t capable of working miracles, as with the majority of their other releases, they have managed to breath a little more life into the recording. The recording always was of a high quality and certainly something that could be classed as excellent, however it now has more warmth and clarity to it – which was sorely needed. The opening few tracks are still a little too sterile for my tastes, and it isn’t until Prince calls for the sound to be turned up during his set that the new, improved recording really kicks in – never more obvious than on ‘U Got The Look’ which is vastly more powerful and impressive than the previous releases version. Improvements to the recording aside, one can do nothing about the bland content of the majority of the show and whilst ‘Little Red Corvette’ is the undoubted star of the entire concert (pour moi), it’s nestled amongst a set-list which the majority of people can recite in their sleep. Disc 2 begins with the excellent ‘Creep’ and is one of the few parts of the recording where the audience appreciation slightly takes over the recording, although it quickly subsides for Ledisi’s shrill version of ‘Angel’ – funnily enough. On and on we go through familiar territory to the closing ‘Let’s Go Crazy’ and the end of the show. 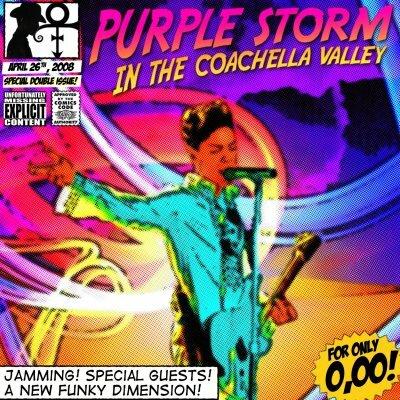 This release also includes Prince’s brief performance on The Tonight Show broadcast the night prior to the Coachella appearance. Overall an impressive release in terms of improvement to the original recording and certainly one which makes the previous release obsolete. Lastly, it’s worth mentioning the artwork which is one of the most creative, original and clever designs I’ve seen in a while on a fan release. Also released in June 2008 by “Eye” Records on their ‘Coachella’ release and in August by Sabotage on ‘The New Golden Age’ – both from this same source recording.